Autumn brings cooler temperatures to the Smoky Mountains. The weather may be cooling down in tiny Park County, Tennessee, but crime is heating up. Weevil Beasley, the county's loan shark, dies and the body count begins. Sheriff Tony Abernathy is soon up to the top of his bald head in murder and mayhem. Tony's wife, Theo, is in the thick of it. Not even the members of her quilting group are immune when she leads them on a thread-filled retreat up at The Lodge. Arriving early for one of the upcoming weddings, a member of their group is murdered. While dealing with cranky quilters, distraught hotel keepers and unfinished projects, Theo has to keep track of gossip for her husband and barely has time to hand out the pattern for her new mystery quilt. Copyright © 2011 by Barbara Graham. Five Star Publishing, a part of Gale, Cengage Learning. No part of this work covered by the copyright herein may be reproduced, transmitted, stored, or used in any form or by any means graphic, electronic, or mechanical, including but not limited to photocopying, recording, scanning, digitizing, taping, Web distribution, information networks, or information storage and retrieval systems, except as permitted under Section 107 or 108 of the 1976 United States Copyright Act, without the prior written permission of the publisher. The publisher bears no responsibility for the quality of information provided through author or third-party Web sites and does not have any control over, nor assume any responsibility for, information contained in these sites. Providing these sites should not be construed as an endorsement or approval by the publisher of these organizations or of the positions they may take on various issues. 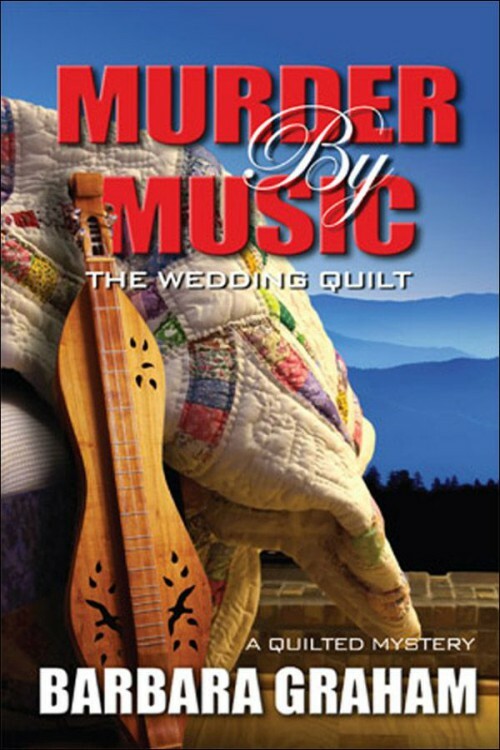 Murder by music: the wedding quilt, a quilted mystery / Barbara Graham. — 1st ed. 1. Sheriffs—Fiction. 2. Quilting—Fiction. 3. Tennessee—Fiction. I. Title. First Edition. First Printing: October 2011. Published in conjunction with the Author. With grateful thanks to my confused but accepting friends and family. I know it can't be easy dealing with my failure to keep up with the real world. To companion dogs without equal—Max and Grace insist I not spend all my time with imaginary friends. We are often together at the lakes checking for ducks, herons, swans, swallows, pelicans, and their favorite—other people with dogs. Last, but certainly not least, my editor Alice Duncan, who makes sense of my stories. This quilt is a large wall hanging or oversized lap quilt. Use flannel on the back and snuggle in for the winter season. Approximately 60″ by 70″. All fabric requirements are generous and based on standard width fabric of approximately 40″ of usable fabric. The instructions assume familiarity with basic quilt construction and sewing an accurate 1/4″ seam. After cutting it out, be sure to save your scraps—just in case. Fabric #1—the main fabric, 2 2/3 yards of a non-directional print with light or dark background and motifs including at least three additional colors. Fabric #2—2 yards of a strong medium matching one of the colors in the motifs. Fabric #3—1 1/8 yards of a medium matching another color from motifs. Fabric #4—1/2 yard of contrasting medium—may be darker or lighter than the others. As you cut, be sure to label pieces by color number and size cut. —Cut 6 strips 6 1/4″ by WOF (width of fabric), subcut into 36 squares 6 1/4″. Cut 5 strips 4″ by WOF and subcut into 48 squares 4″. Cut 3 strips 4 3/8″ by WOF and subcut into 24 squares 4 3/8″. Cut 7 strips 2 3/8″ by WOF. Cut 4 squares 4 1/2″ from the remainder. —Cut 4 strips 4 1/2″ by LOF (length of fabric). From remaining piece cut 8 strips 2 3/8 by WOF (approximately 22″). Cut 2 strips 4 3/8″ WOF and subcut into 8 squares 4 3/8″. Cut 8 squares 4″ from remainder. —Cut 5 strips 2 3/8″ by WOF. Cut 8 strips 2 1/2″ by WOF. —Cut 2 strips 4 3/8″ by WOF. Subcut into 16 squares 4 3/8″. Cut 3 strips 2 3/8″ by WOF. Theo Abernathy tried to massage some of the tightness out of her aching back without Tony noticing. Her husband was worried, which was sweet. She appreciated his concern, but she needed a break and she'd get it in three days. The quilting retreat had been planned longer than she'd been pregnant. Tony tried frowning again, but Theo ignored him. To Theo he said, “Call me if Gretchen can't take you to the shop.” And, after giving her a quick kiss, he trotted down the stairs. Tony opened the front door, stopped and swore softly. Thick, gray fog concealed everything below the top step. Somewhere under it should be a newspaper and three more steps. He explored each step with his foot until he located the newspaper, which he dropped just inside the front door. Cautiously, he continued down the rest of the steps and onto the sidewalk. His wariness was rewarded when he discovered a skateboard in his path. Tony tossed it into the yard. Parked at the curb was his white Blazer with its green trim and insignia. The official Park County Sheriff's vehicle, complete with enough lights on the roof to cover the whole thing. Stopping in front of the Blazer, he whacked the hood with the palm of his hand twice, waited a couple of seconds and whacked it again. A pair of calico cats dropped to the street and shot up onto the grass. As soon as they were a safe distance from him, the smaller one turned and hissed at him, showing a lot of teeth and attitude. Ignoring the cats, Tony climbed into the car, rolled down his window and listened. It was quiet enough to hear the gurgles of the tiny creek running through the park and along the side of his house. He could almost hear the leaves falling.